The jobs I left behind – journalism and TV production – are well-known. They are not well understood and the general public are deeply ambivalent about them. Tell someone you’re a journalist and they often back away thinking ‘Oh God, what did I tell him?’ They say “Don’t quote me.” and “Please don’t put that in the paper.” They say this regardless of how dull and of little public relevance their comments might be. But when they have an indignant sense of some injustice having occurred, they say “Right, I’m going to the papers with this,” and they fully expect us to put it in. When you tell people you’re a TV producer, they say “Can you get me on the telly? I want to be famous.” When you ask them what they want to be famous for, they reply that they don’t want to excel in any particular field. They just want to be famous. On the other hand, people have a deep distrust of ‘the media’ and believe we are part of a conspiracy to protect bankers, crush the proletariat or whatever. I shall miss these standard responses to my work. Now I shall have to get used to the quizzical look and the raised eyebrow. “A mediator? What’s that then? Is it like meditation?” Or perhaps, at social gatherings, when I tell people what I do, their eyes will refocus and look over my shoulder in case there’s someone more interesting to talk to. Someone in the media, perhaps. But yes, that’s what I’ve been up to. As well as getting a shed and learning to ride a motorcycle, I have been training to be a mediator – someone who helps to resolve conflicts before they blow up into court cases, employment tribunals, feuds, wars, you know the kind of thing. I’m still on the course so haven’t done any real mediations yet but I found my experience as an interviewer and as a union rep very helpful. More on that as it happens. Another thing I’ve been doing is voluntary work for the Witness Service, a division of Victim Support. I’ve been working in Cardiff Magistrates’ court and will be in the crown court tomorrow. And another thing – poetry. 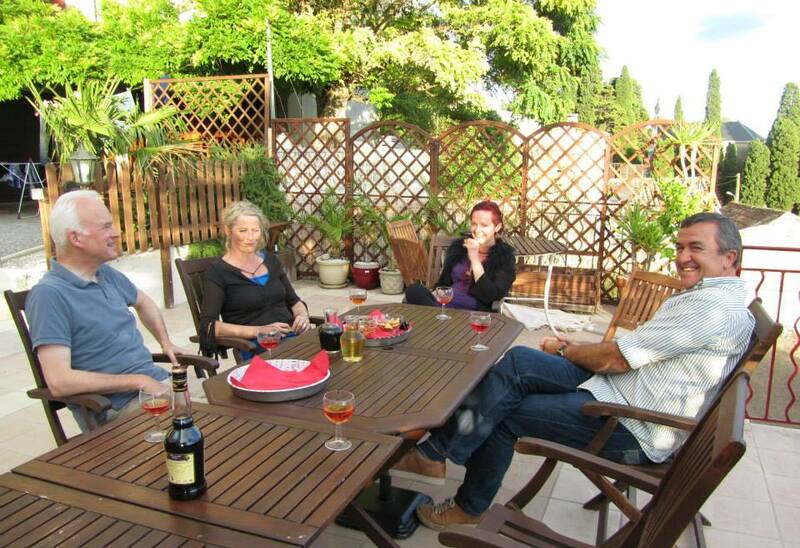 Here I am, in the south of France, practising my iambic pentameter. More about this in a separate post, probably but here’s the thing: accepting redundancy has given me the chance to concentrate on the stuff that I believe in. Witnesses play a vital role in our criminal justice system and they deserve all the help and information they can get. Mediation is an all-round good thing in that it gets to the bottom of conflict, enables people to be happier with each other and saves the nation a fortune. And poetry is one of those precious things that make us human. Of course, I don’t know for sure how any of this is going to work out but it certainly wouldn’t work if I never gave it a try. So, if you’re thinking about redundancy, don’t just think about the negatives. Consider the possibilities if you decide to take the money and run. So, I passed my final test on Monday, 15th April. The next day was the first proper spring day of the year. Daffodils, blue sky, gambolling lambs; it was even a bit warm. My wife got home from work a bit early so she could drive me out to a shed on an industrial estate in rural Vale of Glamorgan to collect the Royal Enfield which you can see on the header bar. It’s the black one on the left. As we stepped out of the house, me in my full motorbike outfit, we waved to our next-door neighbours before getting into my wife’s Nissan Micra. Well, gives ’em something to think about. We arrived a bit early, about 5.20pm, This was the scrubby end of the estate where it almost crumbled away into nearby fields. All was quiet. We could hear blackbirds singing and lambs bleating. Then, the cheerful sound of an easy-going, twin-cylinder engine. Along the track came a three-wheel car that looked like a little aeroplane without wings. At the front, you could see the polished cylinder heads and cooling fins of a Citroen 2CV engine. At the wheel, wearing leather jacket and goggles, was Barry, the aircraft engineer who was about to release the motorbike into my possession. The handover was brisk and cheery. A handshake and a wave and, within a few minutes, I was chugging along narrow, country lanes with my wife’s little red car in the rear-view mirrors. Once on the A48, we stopped at a filling station and she bought me my first tank of petrol. of my first real trip as a street-legal, qualified biker. 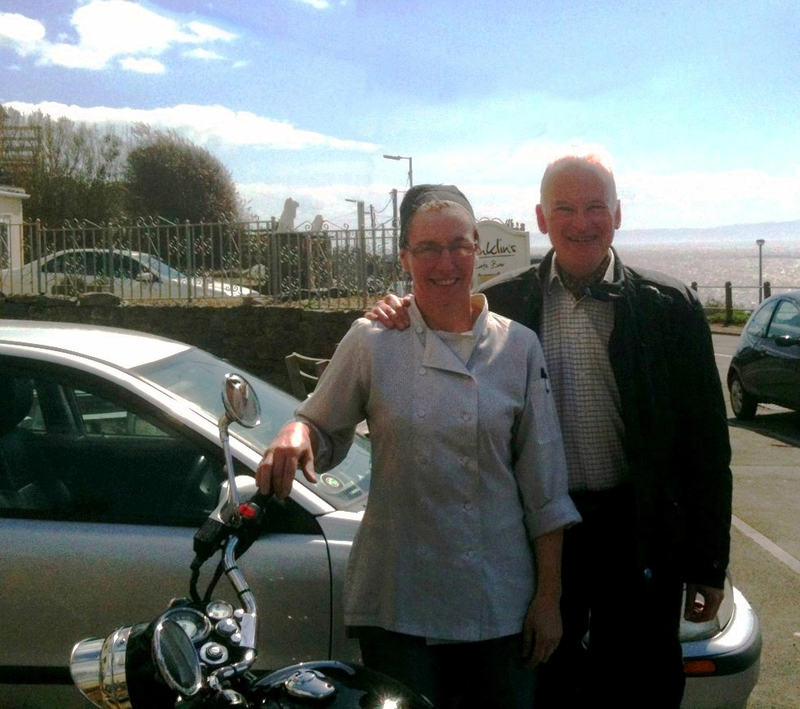 There was only one possible destination – Franklin’s Cafe at Ogmore on Sea. This is where Pam the cook introduced me to Chris, the man who knew Barry who had this perfectly maintained Royal Enfield for sale. Pam was a bit of a late convert to motorcycling (but not as late as I was) and had got an Enfield as her first full-size bike. It was Pam, back in January, who said I should spend my newly-found free time and redundancy money on taking up motorcycling. And so it was quite an occasion when I rode back into the Vale of Glamorgan and thrumbled onto the seaside cafe’s forecourt. Fish and chips and a pot of tea, please Pam! Pam and Nicholas with the Enfield at Franklin’s Cafe. First a shed, now this. Redundancy is starting to resemble a bucket list. Just been on a two-day ‘writing for the web’ course organised by the NUJ. Before I was made redundant, I never went on these courses because I was too busy working and, if ITV wanted me to learn something, they’d train me at their expense and in their own time. Now, however, I am free to make my own decisions about what training I do. The tutor was Simon Williams who teaches at Cardiff University’s Journalism School and is a webmaster for various bodies, including Friends of the Earth. If you click on the blue ‘NUJ’ in the first paragraph, you should be linked through to the NUJ Training Wales website. I didn’t know it was so easy to make such links until I did this course. I’ll go back over previous posts and link to Cardiff Fencing Club and things like that. Most of all, this course made me realise, more than ever, that the web is getting bigger and stronger and more important all the time. There is so much that can be done with it. It’s arguably bigger than the industrial revolution and more of a force for global social change than any political movement. Whatever I choose to do in the future, it will almost certainly benefit from my being up-to-date with the latest developments in the web and the opportunities they all present. Next month, I’m doing a website-building course and I might fit in a social media one before that. Oh no. Not the beige cardigan! I have always worn a jacket. I was probably four years old when I first put on a blazer and I’ve been accustomed to having four pockets – two outside, two inside – ever since. Inside left pocket is my wallet; inside right, the little notebook. Ball-point pen on the left, fountain pen on the right. In the old days, the left outside pocket would contain a packet of Camel cigarettes and there was a Zippo lighter in the outside right. (The Swiss Army knife would be in a trouser pocket.) Before leaving the house, I’d slip on the jacket, tap the pockets to check the proper contents were in place and I was ready to tackle the world. In the very old days – the days of blazers – there would be a words-only version of Hymns Ancient & Modern in the breast pocket. It was against the school rules to appear in assembly without your hymnbook. You could be given detention, or possibly the cane for repeated offences. So it was best to have your hymnbook with you at all times. In recent years (blimey, it’s the last three decades!) Blimey! Right, so …Thirty years ago I gave up smoking so I must have looked as svelte as an Italian with my empty outside pockets until mobile phones appeared in genuine pocket size. I carried two – one work, one personal. The personal one, on the right, was a smart phone which I missed even more than the old fag packet if I didn’t have it on me. If anyone reading this has experienced the cardigan moment, please add a comment and let me know what happens. Once you get the cardigan, is there any way back? Not going to work – the first few minutes. The past two weeks have been something of a ‘phony war’. Yes, I’ve accepted redundancy and done my last day in the office but up till now, I’ve been on holiday as a full-time employee. The past two weeks off work have been made up of paid leave, statutory holidays and weekends. My actual redundancy began about half an hour ago. With office hours of 9.30am to 6.00pm, I would, on a normal day, leave the house no later than 9.15. On a normal work day, I would be listening to Radio 4 in the house and continue listening in the car. Today, it’s Melvyn Bragg’s ‘In our Time’. By 9.29am, I’d be in the company car park waiting for a polite, end-of-sentence moment to turn off the car radio and walk into the building. Today it’s different. At 9.15am, I was still on my cross-trainer, working up a bit of a sweat. I then did 100 bicep curls with a pair of 5Kg dumbells and back on the cross-trainer. The digital display on the radio said 09.29. But I was not in the company car park. At 09.30, a man on the radio said that C.P. Snow had certainly been victimised by F.R. Leavis. And that was it. I didn’t turn the radio off. I continued listening and exercising. I closed my eyes and allowed myself a little indulgence. As former colleagues were sitting down and switching on their computers, I was, in my way, on the move. I was heading into the future; into the unknown. Now I’ve done it about three thousand times. Tomorrow, I shall drive to work as usual, take the second exit off the big roundabout, third exit off the small roundabout and then first right. On my left will be a light-brown hut where a ‘little man’ used to check people in and out of the premises. (It was never a big man in those huts, was it?) But the hut has been empty for years. Driver’s window down, seatbelt off, inside pocket, wallet with security pass to the sensor, the red-and-white barrier tilts upwards and the car moves forward, wallet back in pocket, sharp right into staff car park. It’s all automatic. I suspect that, tomorrow, it will still be automatic and it will not feel special. I’ll let you know. On Friday, it was my leaving do. Lunch with a dozen colleagues in an Italian restaurant. Good company, good food, good wine. Two bottles of champagne sabraged. When I said that, on the first day of not going in to work, I would write down various plans and ideas and arrange them on the kitchen table, my inventive colleagues decided to help and they each wrote a suggestion on the backs of the bloody-awful jokes we got in our Christmas crackers. I have not looked at them yet but have saved them in an envelope for the big day.